PRO Platform™ gives you custom access to the world's largest data set on digital consumer behaviors. Explore the full range of the GlobalWebIndex taxonomy through the lens of custom-created target audiences, analyzing digital behaviors in granular detail and generating unrivalled consumer insight. PRO Platform is comprised of two main sections. Create your segments in Audience Builder, and save instantly to begin exploring their digital behaviors. 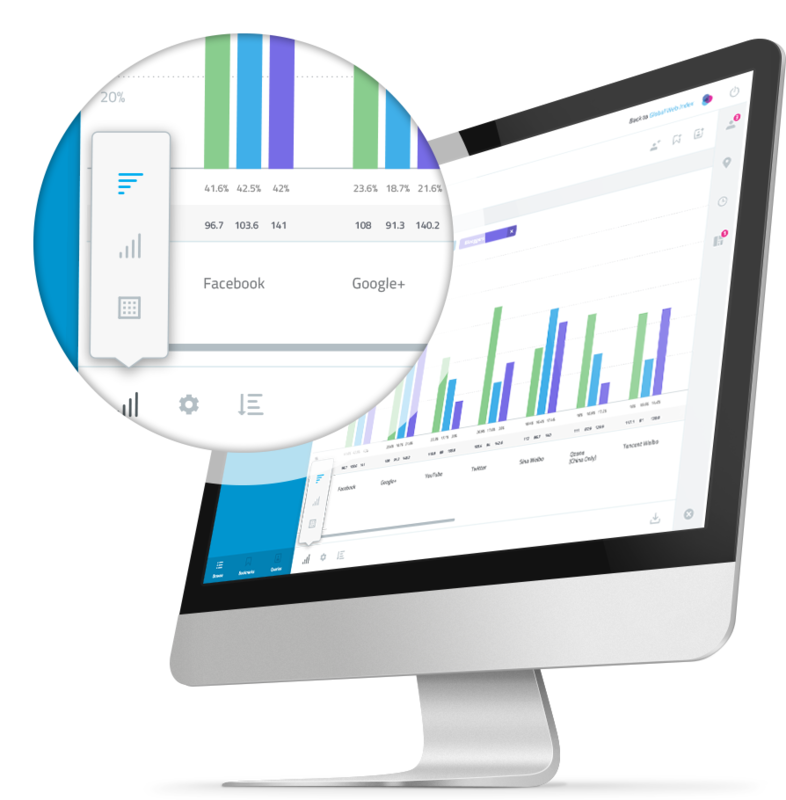 Visualize data in Chart Builder, and export to your planning platform of choice. PRO Platform's Audience Builder interface enables rapid segment creation, with drag and drop functionality and easy grouping at the click of a button. Select an unlimited number of statements to define your audiences, choosing from any variable in the entire GlobalWebIndex data set to examine your audience with specificity. Quickly add AND, OR and NOT operators to your definitions. Utilize the response count visualizer to check your definitions by wave of research and location. Core categories include Personal Profiling, Commerce, Social Media Engagement, Media Consumption and more. View your custom create Private Data in the same interface. Present the data in multiple charts, and export to Excel or as an image for further manipulation or embedding straight into docs and sites. Find what you need quickly by saving commonly used data points, filters and bases. Edit past queries and audiences for quick discovery of new insight. Set any base you want with multiple filters. Use a custom target audience or filter by country, date and more. View percentages, universe size, response counts and now indices - to guage your audience's propensity for a given behavior or attribute. With data that is between 7 weeks and 3.5 months old, GlobalWebIndex gives you a current view on digital behaviors that is not available in traditional market research. Knowing what turns your audiences on and what turns them off enables stronger marketing mechanics that lead to greater ROI. Hone your creative routes knowing what your customers want. Allocate budgets via data-driven decision making. Understand where and when your next customer is most likely to discover your message. Explore paths to purchase and the channels and platforms that best drive awareness, purchase intent and advocacy in your industry and for your target audience. PRO Platform™ is built on the GlobalWebIndex API, leveraging the latest in programming technology and delivering a robust user experience with speed and agility at the core. Subscribers on the Professional plan can make full use of Audience Builder, offering a brand new way to build your target audiences. No more complex logic statements or text selection. Search for what you need, and create complex definitions in seconds. Choose any data point in our entire study, and combine with as much complexity or simplicity as you see fit. Drag and drop statements, turn on AND, OR and NOT logic, and save to folders that make it easy to organize your planning. Have confidence that colleagues and clients will maintain consistency with target audience definitions. Share audiences within your organisation. Professional marketers deal with lots of audiences. Group them according to your clients and products, for ease of access and quick discovery. Use over 40 default GWI audiences to get you started on the road to marketing insight. Edit and build on these audiences according to what you know about your end consumer. Query parameters include the data points you are interested in, the audiences you would like to see data for, as well as countries and date. Splitters are pre-defined groups of audience segments including countries, age groups, income groups, children in the household, social segments and more. Apply them to quickly split your charts out into these commonly used segments, without having to create separate audiences for each. Select from horizontal and vertical bar charts and tabular data format. Rank attributes in alphabetical or ascending and descending order. Change the units on your charts between percentage, universe size, index and response count. Rollover bars to see exact numbers. Turn on and off the metrics that are of interest to you. Toggle individual bars and attributes on and off, as well as option suffixes. Access PRO Platform on-the-go and in meetings. 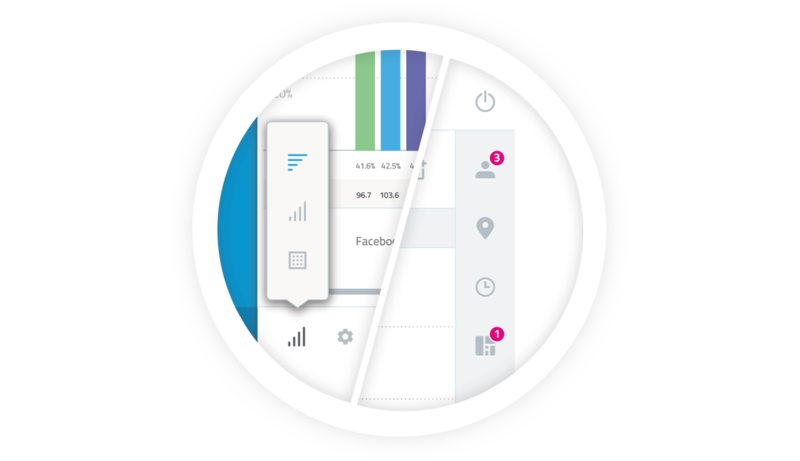 Optimized for tablets to enable insight-generation when you need it most. PRO Platform is built on the GlobalWebIndex API, using the latest programming technology to bring you deliver rapid reponses to the front end. Stop waiting for the software, and get the answers you need at pace. With over 4,500 data points in our core taxonomy, we have worked hard to bring you an easy way to discover data. Start typing to find the attributes you want, or to drill down into your list of unlimited target audiences. Our new navigation panel makes it easy to find what you need. However, for data points that you use repeatedly, save the question as a bookmark or save an entire query with all your filters saved. Export images and raw data to your heart's content, and export multiple saved queries at once for time-saving and ease of analysis. "GlobalWebIndex has bridged a significant gap in consumer knowledge and intelligence, providing an in-depth view of the evolving digital and mobile landscapes across country borders and continents, greatly benefitting our global clients." "I use this tool on an almost daily basis and get loads of value out of it. The new interface has made a massive difference for ease of use and being able to build and index specific audiences against questions." GlobalWebIndex is the advertising industry standard for digital consumer insight. Join our rapidly list of expanding clients that trust our data to inform the most important marketing decisions. Get in touch to schedule a personal consultation on GlobalWebIndex and PRO Platform™. A customer success representative will come back to you within 1 working day.